Discussion in 'Sound Science' started by rafaelpernil, Mar 1, 2018. Which UHQ Upscaler mode do you use on your Galaxy S8/S8+/Note8? Hello guys, since I've bought my Galaxy Note 8, I have been extensively trying each and every sound option available on settings. And I saw this one called Samsung UHQ Upscaler. Trusting my ears I found out to be sounding the best when I only enabled Bit upscaling, but I wanted to see what this was doing, so I took measures with my Focusrite Scarlett 2i2 (2nd gen) connected to my iFi micro iUSB3.0 and RMAA 6.4.1. I also adjusted the input gain when needed to maintain the volume constant. No variation on the frequency response, great! Bit/Bandwidth mode has lower noise but also has some strange peaks arround 200Hz, 400Hz and 750Hz and Bit mode has lower noise without strange peaks. 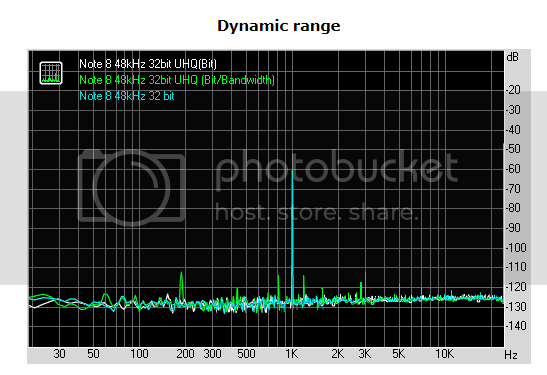 Now we have a worse dynamic range on Bit/Bandwidth mode. And a slightly better dynamic range on Bit mode compared to having UHQ completely disabled. But it is within margin of error. Here comes the disaster. 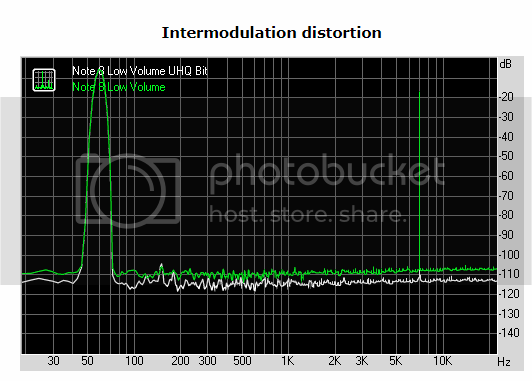 Bit/Bandwidth mode is generating tons of harmonic distortion! Bit mode and disabled have the exact same distortion (result within margin of error). 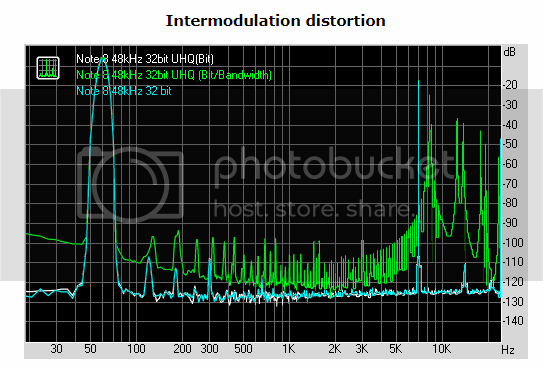 And if that weren't enough, Intermodulation distortion on Bit/Bandwidth mode is crazy high! And again, same results on Bit mode and disabled, if anything, slightly better on bit mode. Aaand here we have an interesting result. Bit/Bandwidth is giving the worst result by far doing weird things with sub bass frequencies. 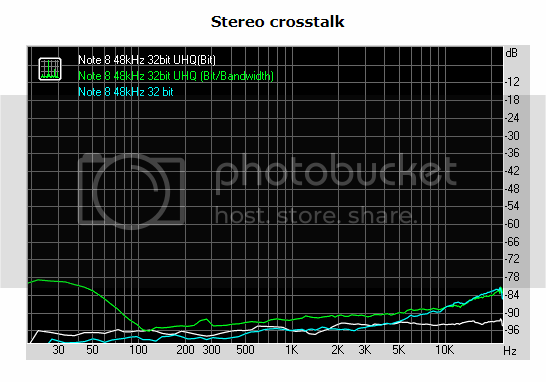 With UHQ Upsaling disabled, we get better crosstalk up to 5kHz, when Bit Upscaler keeps it lower than -90dB. Amazing! I have repeated this test a few times and the results were consistent. Analyzing the results, I see bit upscaling is really making some improvement. And we completely discard Bit/Bandwidth mode. 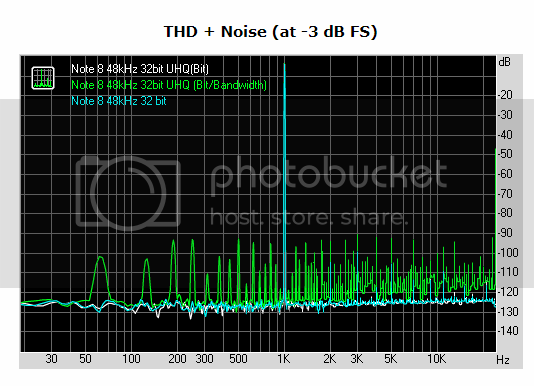 As you can see, we get lower noise, 6dB MORE OF DYNAMIC RANGE, lower THD, lower IMD and better crosstalk. 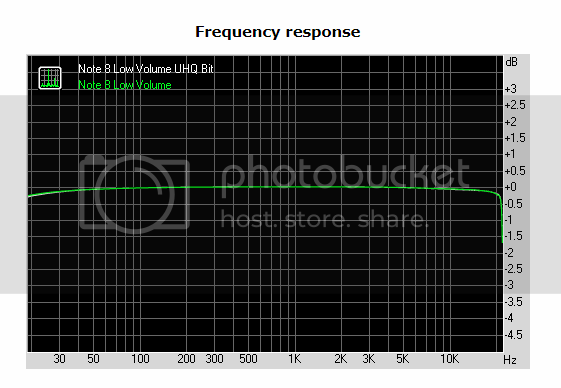 UHQ Upscaler on bit mode shows a lower noise level specially on higher frequencies. Awesome! An enormous difference in dynamic range, a whole bit is recovered with 6dBs more of DR.
And significantly better crosstalk overall. Now, my conclusions about this are that indeed UHQ Upscaler on Bit Upscaling mode is the best option objectively talking. 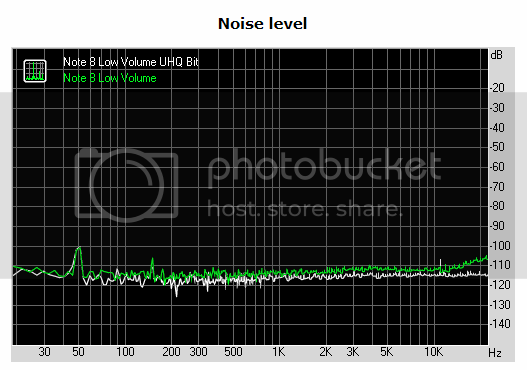 It seems to help quantize giving more resolution and lower noise. And I can lower the volume finally without loosing almost any quality. Thanks for reading. What are your thoughts about it? Nothing there appears to be in the audible range for normal music listening. Have you tried doing a blind comparison? My typical music listening scenario is more like the second one, at low volume. And there, I really notice the difference in noise floor and detail when changing between Bit upscaling and no effects. But I might try making a blind test to confirm it. I wanted to give my grain of sand to this topic since I have not found any information about the actual effect of this function. You can hear a 6dB difference in a noise floor around -100dB at a low volume level? Are you sure something else isn't creating the noise? Well, I guess I have to make a blind test and analyze the results. Thanks for the input! So, I might be missing something, but changing a digital audio signal from 16 bits to 32 shouldn't affect the output if the original file was 16 bits. You have the same number but basically add more zeros after the decimal point (not literally, but that's more or less the result). The fact that you got different results after upscaling (whether or not it's audible, I am not going to argue right now) to me indicates that maybe there is some problem at the firmware or OS level. In other words, maybe some other step of the phone's DSP is creating distortion / noise that varies with bit depth. Again, I'm assuming the upscaling itself has no direct benefit. THD changing with bit depth is not something I have seen before. Noise could theoretically improve if you switched the output mode of the DAC, so that sort of makes sense, but the rest has me scratching my head. 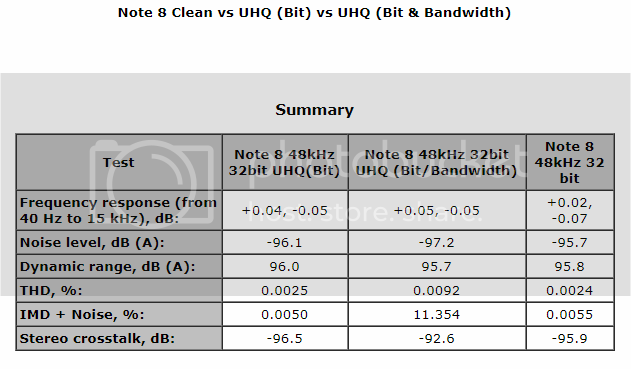 Someone correct me if I'm wrong, but I was under the impression that upscaling to 32 bit technically shouldn't make any difference at all, assuming the source signal is the same. Why there is a difference is the question you ask after you determine that there actually is a difference. True story. Looking at the graphs I initially assumed the measurements were indicative of a real performance difference. However, looking again, all of the changes seem to be roughly of the same dB difference. Maybe there is a funny scaling factor in there somewhere. Anyway, if the differences are real, they are big enough to deserve some explanation, whether or not they are audible. Down that far, could it just be pushing the limits of what the testing equipment can measure? I generally don't care about inaudible sound. I've got my hands full with improving audible sound. I'll have to let raphaelpernil speak to the sensitivity of his gear, but the differences look so consistent that to me it suggests a common underlying cause. I'm part of team Practical Application of Science. I'm not so keen on the navel gazing side of science. Wish I had your tools to do the same thing for my exynos s9+. I have a DAC but I might sell it as my s9 sounds better than my s8 plus is he a a mojo I can always use. Portable DAC: OPPO HA-2(sold), OPPO HA-2 SE(sold), Chord Mojo.